The Roman Revolution is a profound and unconventional treatment of a great theme - the fall of the Republic and the decline of freedom in Rome between 60 BC and AD 14, and the rise to power of the greatest of the Roman Emperors, Augustus. 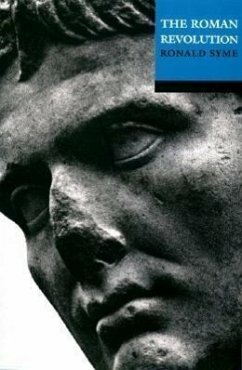 The transformation of state and society, the violent transference of power and property, and the establishment of Augustus' rule are presented in an unconventional narrative, which quotes from ancient evidence, refers seldomly to modern authorities, and states controversial opinions quite openly. The result is a book which is both fresh and compelling. Sir Ronald Syme (1903-1989), one of the most distinguished Roman historians, was Camden Professor of Ancient History at Oxford University. In addition to numerous awards and honors, he collected honorary degrees in eleven countries on five continents. Dieses Buch von Syme gilt als das Beste über die entscheidenen Jahre die zum Ende der Republik führten. Es ist gut zu lesen und ein dicker Schmöcker für lange Winterabende. Fast schon legendär ist die Abneigung von Syme gegenüber Augustus weswegen das Buch aber noch nicht als tendenziös zu bezeichnen ist. Insgesamt sehr lesbar, wenn auch die Fülle der Namen der handelnden Akteure einiges an Konzentration verlangen. Auch auf Englisch gut lesbar.